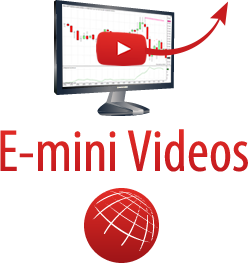 E-Mini S&P Day Trading Videos – Learn to Trade: Welcome! The last few days using the Atlas Line have been quite profitable. The signals have been nearly-dead on. We’re not sure why John Paul uses the Bounce signals, as many of his other videos mention turning this feature off. Regardless, the Long and Shorts were very accurate. Using the NinjaTrader platform, John Paul scrolls through the most recent four days. As you can see, the rules for entering and exiting a trade are straightforward. They’re taught in detail in the live training that’s included with purchase. Additionally, you are taught how to use the S and P symbols that appear on the chart – indicating entries for additional Strength and Pullback trades. You will of course have losing trades. Many days are profitable, some are break-even, and a few are losses. The recent trades page provides a history of recent trades taken by John Paul. As explained in the above video, high frequency trading is the quick execution of buy and sell orders by a computer algorithm sent to a financial market. Keep your trading stable among the fast HFT world by watching more trading videos. Many of these high frequency orders are placed in bursts, hoping another algorithm will pick up and buy or sell based on the aggressiveness of another “robot.” This type of trading now accounts for around 70% of all orders processed in the major exchanges, such as the NYSE and CME. Computers with the most direct access have a distinct advantage over competing robots, as they know what price will be ahead of competitors. This created a race to build the fastest fiber optic line from Chicago to NYSE. The reason for this is the Chicago commodities markets influence the indices trading in the NYSE. The price of crude oil is related to the Exxon stock and vice-versa. One can easily understand why companies have spent millions trying to get the most direct route; whether blasting through a mountain or broadcasting through soon-to-be-built towers. In fact, professional trading firms have rented servers inside the exchanges themselves for the shortest physical distance possible. The NYSE has gone through the trouble to provide equal cable length to all servers inside its 20,000 square foot server room. This raises concern as trading has become a game of who can program the most profitable robot, disregarding the underlying economics. The flash crash of 2010 demonstrated a pitfall of high frequency trading – we still cannot account for the hundreds of billions lost (that have since rebounded) during the three minutes or so of the crash. Purportedly, one man’s algorithm (and sizable account) created a domino effect among the other algorithms, creating a vacuum that was only stopped by an emergency “breaker” flipped in the exchange. This mini-documentary has audio produced by Radiolab. This is a more recent demonstration of one of the free trading techniques – the ABC Pattern mentioned on the DTTW trading videos page. You can trade this ABC strategy on stocks, commodities, forex, and other markets. On the given day, price was trending – heading in a steady direction. If you can know in advance with reasonable certainty if price is likely to head higher or lower at a given time, you can position yourself to make profit. The ABC pattern splits the day into three segments – morning (A), early afternoon (B) and late afternoon (C). By referencing what price did in the A part of the day, you can get an idea of what will occur in the B part of the day. The same holds true for B and C. Each part has its own characteristics. At market open in the A part (9:30 a.m. to 12:00 p.m.), automated systems, swing traders and large financial institutions create volatility. In part B (12:00 p.m. to 2:30 p.m.), have an expectation that the market will slow down. At the C part of the day (2:30 p.m. to 4:30 p.m.), expect a late day rally or sell-off. Watch the video so you know how to draw the breakout lines at the correct price points – lowest low and highest high in A followed by two consecutive closes above or below the range you’ve defined in A. However, this breakout is not likely to happen, as B is less active. Whipsaw price activity – back and forth movement, is more likely to occur. Watch the video for the rules of trading section C, as the rallying or sell-off will likely add volatility / tradability back into the picture. Disclaimer: content was produced in affiliation with DayTradeToWin and should be considered an advertisement. No guarantees of trading performance or results are being made. Trading may result in significant financial loss. Past performance is not indicative of future results.